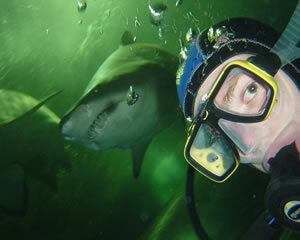 Master your fears and experience a shark dive today! Diving with sharks is one of the most exciting extreme sports you will ever do. 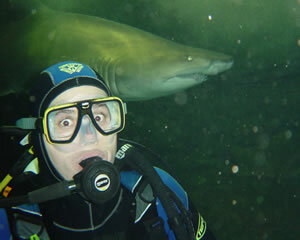 Shark diving is safe and you are guided by experienced divers all the way. There are shark dives available all across Australia.If you want to dive with sharks with the added comfort of a cage or just scuba dive with sharks, there is a shark diving package for you. 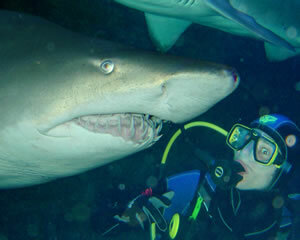 Go on, face your fears and book a shark dive today. 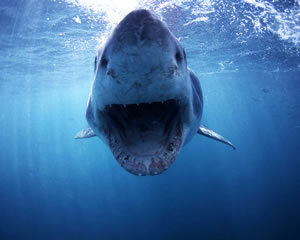 Experience the huge adrenaline rush of coming face-to-face with a shark, one of the most feared creatures of the deep. Take the plunge inside Melbourne Aquarium's 2.2 million litre Oceanarium...if you dare! you'll also encounter other creatures of the deep. It's an experience you'll never forget. 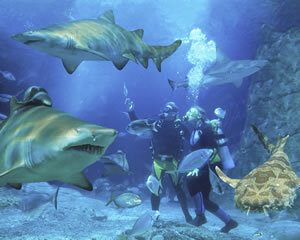 Enjoy the ultimate diving experience where people interact with sharks in their territory! Face your fears or simply analyse these fascinating kings of the sea from within the aquarium tank. 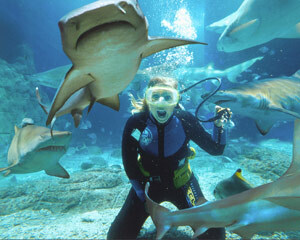 Enjoy the ultimate diving experience where people interact with sharks in their territory! Face your fears or simply analyse these fascinating kings of the sea from within the aquarium tank. Non-Certified divers welcome! An exclusive shark dive with a group of friends or colleagues will be an unforgettable experience. In the safety of the oceanarium with professional dive instructors, you'll get up close and personal with huge grey nurse sharks, stingrays, sea turtles, wobbegong sharks, moray eels and much more. If you've ever wanted to go scuba diving with sharks this is the experience of a lifetime. You'll get up close and personal with huge grey nurse sharks, giant stingrays, sea turtles, wobbeygong sharks, moray eels and much more. This dive will definitely be one for the log book! Plunge into this amazing underwater world and discover a reef teeming with sharks, imposing stingrays and majestic turtles as you swim your way around Western Australia's largest salt water aquarium in this incredible shark diving experience! Never been scuba diving before? Here is your chance to get up close and personal with huge grey nurse sharks, giant stingrays, sea turtles, wobbegong sharks, moray eels and much more. Under a safe and controlled environment with professional dive instructors - this is the opportunity of a lifetime! Experience the opportunity of a lifetime! The chance to dive with sharks and other amazing marine creatures that most people only ever get see on wildlife documentaries. This is the opportunity of a lifetime if you've ever wanted to dive with sharks. You will get up close and personal with huge grey nurse sharks, giant stingrays, sea turtles, wobbegong sharks! 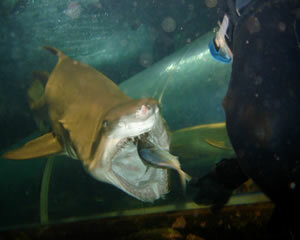 By booking onto the Shark Feed Dive, you will be underwater with the sharks during a feeding session. Imagine being just metres away from 3.5m sharks as they are hand fed by the aquarists at Manly.